Would I be willing to drop my stone first? The story begins with a trap set by the teachers of the Law and the Pharisees. The trap involved a woman caught in the act of adultery. Early in the morning he came again to the temple. All the people came to him, and he sat down and taught them. The scribes and the Pharisees brought a woman who had been caught in adultery, and placing her in the midst they said to him, "Teacher, this woman has been caught in the act of adultery. Now in the Law Moses commanded us to stone such women. So what do you say?" (John 8:2-5 ESV). These "religious" leaders brought the woman into the courtyard to stand judgment for her sin. Apparently not totally out of the ordinary, one has to wonder how often this was done. Regardless, this story is less about the woman and more about an opportune time for these leaders to put pressure on Jesus and catch him in a mistake. This they said to test him, that they might have some charge to bring against him. Jesus bent down and wrote with his finger on the ground. And as they continued to ask him, he stood up and said to them, "Let him who is without sin among you be the first to throw a stone at her." And once more he bent down and wrote on the ground. But when they heard it, they went away one by one, beginning with the older ones, and Jesus was left alone with the woman standing before him (John 8:6-9 ESV). Although John doesn't say it explicitly, the silence in this moment of truth must have been unnerving. In that moment when Jesus bent down and wrote on the ground for the second time, I can't imagine any other sounds in the area of the temple courts other than that of stones dropping to the ground, the quiet sobbing of the woman in front of Jesus, and the shuffling of feet as those who moments earlier were ready to stone her, turn and leave the courtyard. Can you imagine how deafening that must have been? One moment, this woman was humiliated and feared for her life. Then, as the stones dropped to the ground, she received another chance at life. Or, since we do not know her whole story, maybe this was really her first chance for a real life. Jesus stood up and said to her, "Woman, where are they? Has no one condemned you?" She said, "No one, Lord." 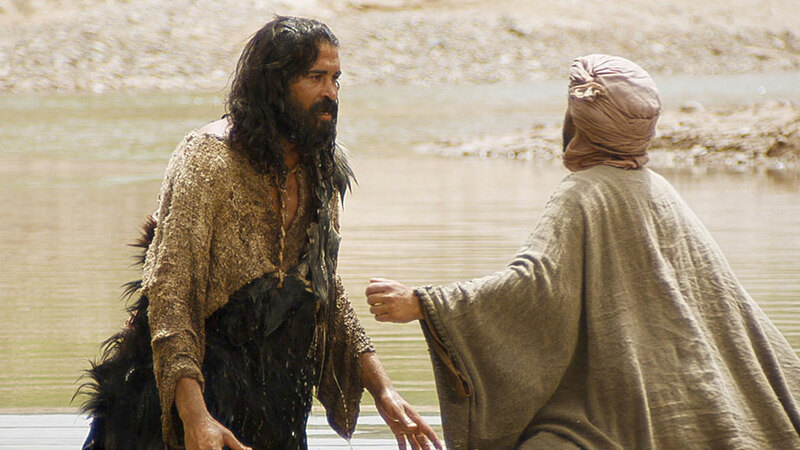 And Jesus said, "Neither do I condemn you; go, and from now on sin no more" (John 8:10-11). As Jesus spoke to her, this woman opened her eyes and looked around to discover that the sound she heard actually was that of stones dropping to the ground and her accusers leaving her behind. As she wiped the tears from her eyes, or perhaps Jesus did, she began to see as she had never seen before. Instead of seeing a life of condemnation and shame, for the first time in a long time, she saw a life of hope — not a wishing kind of hope, but a solid assurance of a new future. Instead of seeing rejection and scorn in the eyes of religious leaders, for the first time she felt the power of forgiveness — not just talk about forgiveness intended for someone "more worthy," but real forgiveness for her. Instead of being the tool of men for pleasure or for making a trap, for the first time she began to think in terms of newness, refreshment, and kindness, not dread and disappointment. Who am I in this story of conflict and grace? Jesus' stories give us the opportunity to ask, "Where am I in this story? Whose role in this story is most like mine?" 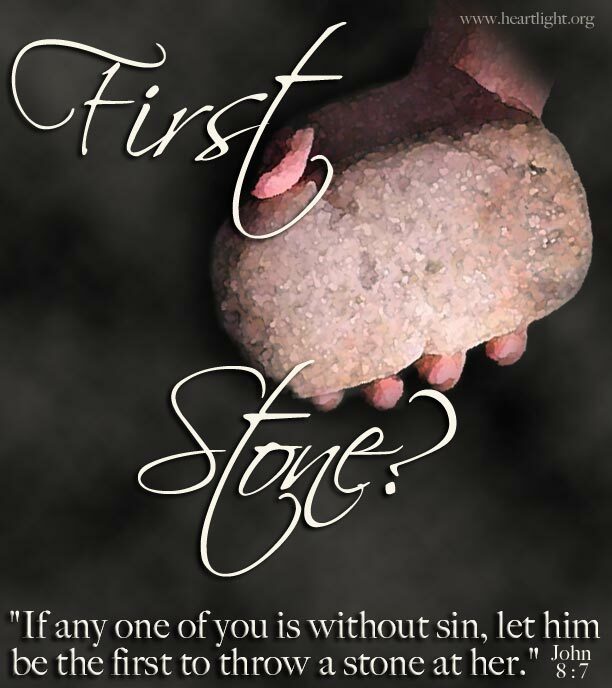 Like most of the Lord's critical stories, this one is aimed at those who held the stones in their hands. They had already passed judgment on this woman. Once again, she is little more than an object to be used... this time by religion. They had little or no concern for her; she was useful only for catching Jesus in some misapplication of the Law. How many times have we made judgments about others in comparison to our superior righteousness? How many times have we looked down on other trapped in a cycle of sin and degradation? If we find ourselves identifying with this group of the religious critics, isn't it time we heard what that stone sounds like when our hands release them and let them drop to the ground with a gracious thud? Maybe we identify with the woman. We are guilty. The judgment passed against us is true and right. Whatever punishment the law demands of us, it is justified. Any feelings of value or self-worth left us long ago. The humiliation we feel as we stand there in the middle of the courtyard of condemnation is only unique because we now stand there alone with Jesus. As we await His sentencing, we are stunned. Instead of glaring eyes and painful stones, we hear Jesus' gentle voice ask about our absent accusers. When we acknowledge that they have departed, we are further stunned as we hear Him say, "Neither do I condemn you. Go and leave your life of sin." Could this be happening? Could Jesus possibly be forgiving me? Could this One they call Savior actually be this loving, this gentle, this kind, this merciful? Some of us, when brutally honest with ourselves, will identify with the judgmental crowd. Others of us will identify with the condemned woman. My hope is that we will strive to identify with Jesus. My prayer is that we will develop a spirit more like that of our Lord. We are not the judge; though Jesus certainly could have judged the woman. We are not one of those who condemns; though the Lord could have condemned her. Instead, may we strive to be like the Savior. Let's be one who loves gently, defends passionately, judges rightly, and forgives completely! Special thanks to Free Bible Images and the Lumo Project for use of images in Jesus' ministry. "The Grace of Dropping Stones" by Tom Norvell is licensed under a Creative Commons License. Heartlight encourages you to share this material with others in church bulletins, personal emails, and other non-commercial uses. Please see our Usage Guidelines for more information.